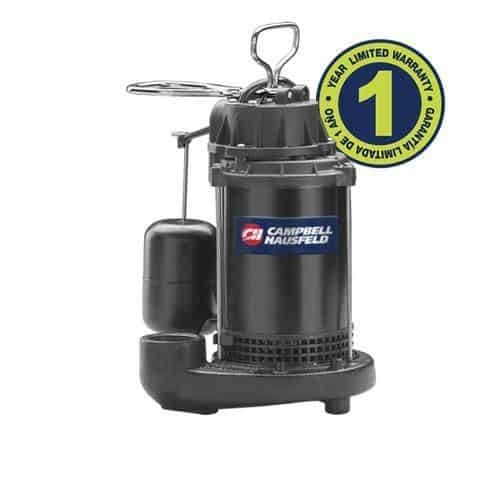 Manufactured in the US, Campbell Hausfeld 1/2 HP Cast Iron Submersible Sump Pump ensures the finest quality parts that offer better suction and effective cleaning. This sump pump by Campbell Hausfeld boasts of employing the latest technology and design for effortless cleaning operations. It comes with a Top Suction design which is easy to operate, reliable to use on hard surfaces such as Basements. Equipped with a Split Capacitor Motor, it consumes lesser power yet generate sufficient suction power. Its Rugged Cast Iron Base makes it durable and noise free. Also, Epoxy-Coated Motor helps to keep it corrosion resistant. It requires proper cleaning post usage as the parts such as “Airlocks “are quite sensitive and not for rough & tough usage, possibly the only drawback in this sump pump. Corrosion Resistant – Comes with Epoxy Coated Motor to ensure reliability and longer life. Long Motor Life – 1/2 HP Split Capacitor motor for effortless suction with the usage of fewer amps resulting in reduced power consumption. Improvised Pipe Size – It comes with 1-1/2″ Standard Discharge Pipe size for effective suction. Locally Manufactured with Fine Quality – Good quality parts manufactured and sourced within the US with a 1 Year warranty for the complete satisfaction of the customers. Buzz Free – Reduced Noise levels due to the “Rugged Cast Iron Base” as the Core Ingredient. Portability – Better Portability & Convenient Handling even when you have to clean corners of your basement. Great Design – Designed perfectly to fit in the basin as small as 11″ wide and still generate 5100 GPH max flow; 3840 GPH at 10′ discharge height.